There are book recommendations, and then, there are special book recommendations. When your mother says you should read a book, it qualifies as an extra special book recommendation. In other words, when mom says you should read The Boys in the Boat by Daniel James Brown, you don’t ask why, you just do it. I must admit that I was a little perplexed as to why my mother would find a book about the 1936 US Olympic men’s crew team interesting. After reading it, I figured out why. While the book covers the sport of competitive rowing, that’s not it’s primary theme. The book is more focused on the struggles facing America during the late twenties and earlier thirties. There were the effects of The Great Depression. The drought that turned middle America into The Dust Bowl. The rise of Hitler and the imminent threat of a second World War. Truth be told, it was a turbulent time. The book is really about how a group of boys came together and persevered through dedication and hard work to reach their ultimate goal against all odds. 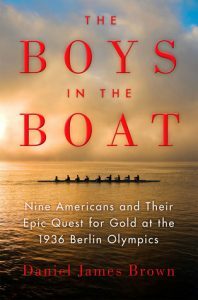 Brown does an outstanding job telling the story of the University of Washington crew team that went to the 1936 Olympics in Germany. He uses descriptive language to paint vivid pictures. It makes you feel like you are a part of every scene as it unfolds. There’s the harsh conditions the team practiced under, the tension and rivalry of the regatta races between UW and Berkeley, the trans-Atlantic journey to the Olympics by ship, the stacked deck the team faced at the Games, and more. Basically, Brown helps you to understand the harsh reality people faced in America during the late twenties and early thirties. It certainly makes you appreciate how easy we have it today by comparison. More importantly, you understand how the hard work and sacrifice of that generation built the great nation we live in today. Brown also does an excellent job weaving history into the story. The world was a different place leading up to World War II. The mass media that is pervasive today was just emerging. It’s interesting to see how Hitler’s regime used propaganda to influence the public. Looking back, the atrocities he committed are obvious. It wasn’t as obvious to the general public inside and outside Germany leading up to the ’36 Olympics. Brown shows how Hitler masterfully used mass media as a weapon to shift public opinion in his favor in spite of reality. Overall, I found The Boys in the Boat to be a fun read. It started a little slow through the first half of the book. Brown spends time building up the back story of the individual members of the crew team. He talks about their upbringing, their struggles, and how they became a part of the crew. It feels tedious at times, but it’s necessary. Seeing how boys from such diverse backgrounds came together as an inseparable team is special. Even more special is seeing how those bonds extended an entire lifetime. So while the first of the book is a touch slow, the second half of the book really picks up the action. Recounting their journey to the ’36 Olympics is a page turner. It was hard to put down, all the way up to the final races in Germany. Simply put, it was awesome. The Boys in the Boat is a read that I would highly recommend. If you can push through some slow areas of the book, you’ll be handsomely rewarded with an epic tale of dedication, perseverance, and teamwork that not only led to Olympic glory but also built a nation. This entry was posted in Book Reviews, Fun Reads and tagged Books, fun reads on February 7, 2018 by Gregg Borodaty.